You’ve probably heard of these classic lighting styles like the high key lighting of Hollywood musicals and the gritty, contrasty look of film noir. 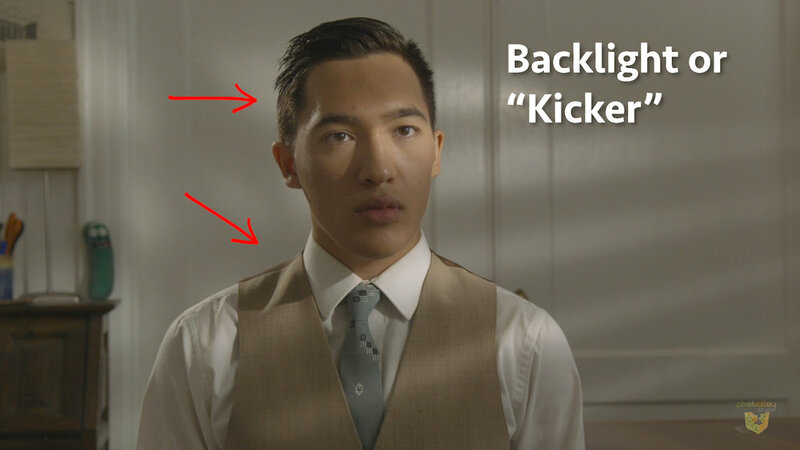 Let's look at how contrast defines them and some lighting techniques that make up these lighting styles so you can work to create them on your productions. We have one sun on our planet and therefore a single key light is the norm. It lights the world around us too, our ambient light, and the light reflected off that world falls on our shadow side, our fill light. Sometimes, light even hits the back of us, creating a back or edge light. Contrast is the difference in tone, the light level, between these areas: key & fill on the face, backlight on the edge, ambient on the background. The Contrast Ratio is the difference between the key and fill light levels. The Contrast Ratio refers to the difference between key and fill on the face. The higher the ratio, the higher the contrast in your image. With a light meter, I’ll read the key side by blocking the fill light with my hand. For the fill, I’ll block the key. The difference is our contrast ratio. Blocking the fill light off your light meter to get your key light reading. Blocking the key light off your light meter to get your fill light reading. I'm using an incident light meter. It reads the light falling onto your subject and it’s used between the subject and the lights. You could use a reflected light meter, which reads the light reflected off your talent. The light on its way to your camera. You could use your built-in camera light meter if you have to, by zooming in and reading a white or gray card you hold up to your key and then your fill light. You’re not reading for exposure, just the difference, the contrast, between key and fill. Note. When reading the key side, you may need to read the fill light that’s also falling on it in addition to the key. This is because your fill light can come from the fill side of the actor, but also it can come from the camera. And therefore has a slightly different effect. Fill light from the side doesn't "fill in" the shadows on the key side. Front fill does. Front fill placement next to the camera. You see, the key creates shadows on their key side. A fill light on the fill side doesn’t light those key side shadows. But if it’s closer to the camera, it does. It’s lighting all the shadows that the camera sees. So if you do fill from the camera, make sure when getting a key reading on your meter, you allow the fill to hit the key side of your meter as well as the key light. Kill + Fill = key. What if you don’t want any fill, including the ambient room light? Negative fill, the opposite of a fill card. You can use the black side of showcard or foam-core or set a flag. You’re basically blocking as much light as we can from hitting that fill side. The black side of a 2x3' showcard is used here to block fill light front hitting the subject, called Negative Fill. To add to the contrasty look of the film noir shot, I’ve added a backlight on my fill side and angled it so it gives me a hot kick off the hair and the side the face. Edge light on hair and shoulder also "kicks" light off the edge of talent's face, creating contrast with the shadow on their fill side. I can also adjust the ambient level behind my subject, by adding or blocking light. Here in film noir, I’m using a set of venetian blinds rigged to a c-stand as what we call a cucoloris, to create shadows and therefore contrast on the background and talent. A venetian blind is rigged in front of the key to create shadows on talent and background, a type of cucoloris. Note, taking light readings when using a cookie, or cucoloris on talent can be tricky. I tend to make sure my light meter reads the light vs the shadow of the cookie. Film noir shot contrast ratio readings. The contrast ratio of the film noir shot is 8:1, a 3 stop difference, between key and fill. The backlight I set by eye. In the Musical high key lighting, I’m shooting with a 1:1 ratio. My key and fill match and we even have white showcard bounce from the bottom in addition to an eye light. As flat lighting on her as possible. High key lighting is generally flat. Here we shot at a 1:1 contrast ratio. In Glamour, we lost the venetian blinds, increased the fill light level so our contrast went from 8:1 of film noir to 2:1, and we opened up our f-stop from a f/5.6 to a f/2.8 for a soft out of focus background. We added an ND filter to take 2 stops away to compensate. We also softened our eye light with some diffusion and increased its brightness a little.